The regulation of arbuscular mycorrhizal development and nodulation involves complex interactions between the plant and its microbial symbionts. In this study, we use the recently identified ethylene-insensitive ein2 mutant in pea (Pisum sativum L.) to explore the role of ethylene in the development of these symbioses. We show that ethylene acts as a strong negative regulator of nodulation, confirming reports in other legumes. Minor changes in gibberellin1 and indole-3-acetic acid levels in ein2 roots appear insufficient to explain the differences in nodulation. Double mutants produced by crosses between ein2 and the severely gibberellin-deficient na and brassinosteroid-deficient lk mutants showed increased nodule numbers and reduced nodule spacing compared with the na and lk single mutants, but nodule numbers and spacing were typical of ein2 plants, suggesting that the reduced number of nodules in na and lk plants is largely due to the elevated ethylene levels previously reported in these mutants. We show that ethylene can also negatively regulate mycorrhizae development when ethylene levels are elevated above basal levels, consistent with a role for ethylene in reducing symbiotic development under stressful conditions. 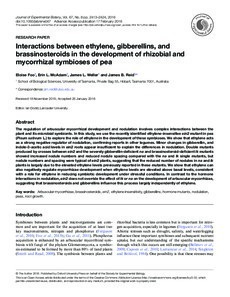 In contrast to the hormone interactions in nodulation, ein2 does not override the effect of lk or na on the development of arbuscular mycorrhizae, suggesting that brassinosteroids and gibberellins influence this process largely independently of ethylene.